You spend weeks writing an ebook, setting up a webinar or creating a case study. You release it, excited to see the leads roll in. And you get a few, you do. But ultimately you’re disappointed. At the end of the day you spent a week creating something you’re proud of and your landing page has what, a couple visitors? You’re starting to wonder what you’re doing wrong. I mean, everybody else seems to find success with email-gated content. Why can’t you? It’s a legitimate question. 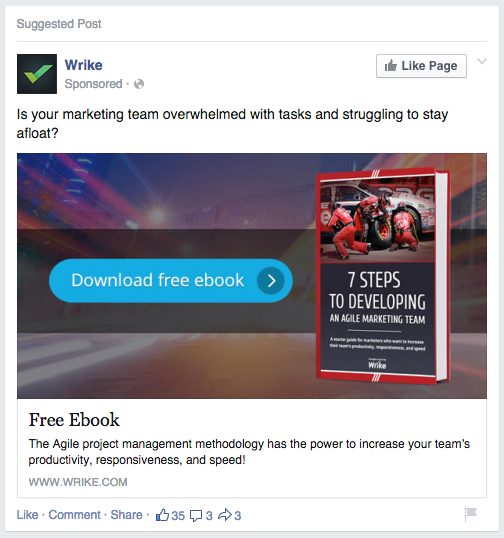 In the past year or so Wishpond has found the answer to be, resoundingly, Facebook Advertising. In this article I’ll show you how B2B content marketers can find a solid ROI and ultimately, success, by promoting their email-gated content with Facebook Ads. Successful content marketing isn’t just about content creation, it’s also about the marketing of that content you’ve created. Who are we kidding? If we want to succeed in B2B lead generation we have to put content in front of a targeted audience just as much as a B2C company selling eco-friendly hair products. Leads are valuable to our business (ideally, you know exactly how valuable). And readers are just prospective customers who don’t know it yet. The Facebook Ad platform gives you access to a possible lead list of 1.35 billion monthly active users. No matter who your targeted audience is, you can bet they’re on Facebook. And, with the unparalleled targeting capabilities, you can ensure your ad will be seen by the people you want to click on it — i.e., those who are most likely to want to engage with your content. 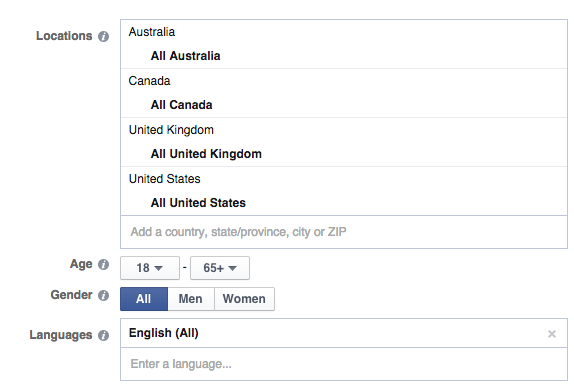 The most straightforward targeting strategy with Facebook ads is demographics: age, gender, location, language, etc. Apart from ensuring you’re exclusively targeting English-speakers within your target countries, B2B content marketers don’t need to mess with this section much. If I targeted just this audience (without any of the strategies below), my Facebook Ad would have a possible audience of 228,000,000 users. The click-through rate would be nonexistent. This gives you a target audience of 158,000. I’ve targeted primarily by job titles which deal with the topic of my webinar. I’ve also thrown in a bit of industry thrown in there for luck. Interests (gathered primarily from Pages Liked) give you a great insight into what your target audience cares about (rather than who they are, above). When Interests are combined with Behaviors (like small business ownership or Facebook Page admin, for instance), you get a pretty specific and highly-converting audience. This gives you a target ad audience of 194,000. Remember that you need to be showing your Facebook ad to enough people that a click-through rate of 0.05 percent brings in enough visitors for it to make sense, but few enough that those visitors are actually interested in your content and will engage on your corresponding landing page. The color scheme: The red, purple and grey contrast well with the Facebook Newsfeed and attract the eye. The length of copy: I like that Wrike used less text than Facebook allowed them. Case studies unanimously agree that less is more when it comes to ad copy. The headline: “Free Ebook” - short and sweet, this tells you exactly what you’re going to get when you engage and also makes sure viewers understand they’re not paying anything to do so. The CTA button: Actionable and decisive, this CTA button is visible and includes clear copy which tells you exactly what a click-through means (downloading a free ebook). Copy like “Download free ebook” or “Get my free ebook” also help with conversions on the ad’s corresponding landing page compared to “click here”. The question: While I stand by my assertion that questions are great hooks, this one is a little too intense and may (arguably) be alienating their target market. I’d recommend they find a compromise like “is your marketing team struggling to work cohesively and achieve the results you need?” or something even better. A red CTA button: While the blue does stand out from the rest of the ad, I’d be interested to see if contrasting from the rest of the Newsfeed might be more important in catching the eye of Facebook users. The ambiguity: I’d definitely be interested to see the results of a value proposition test. “The power to increase your team’s productivity, responsiveness and speed” doesn’t really tell me much. Even something like “”The Agile project’s 7-point management methodology has the power to…” might improve conversions. The size of text: Recognizing that Facebook only allows your ad image to be 20% text the second part of this ebook’s title is still only barely visible, especially when seen quickly. I’d test making it a bit larger. We run our webinar ad for between 5 and 10 days - after 10 days our Frequency gets too high (5+) and our ad will start experiencing Facebook Ad ad fatigue. They convert on that page at 25%. This results in 7.5 leads from your Facebook Ad campaign. Total ad spend is $36. This is where I’ll stop, as every business and industry has a different lead value, but remember that these are good leads. These are leads who (in the case of this targeted audience) you know own a small business and are interested in your business’ services. Also remember that my estimates are conservative. Roughly 85% of B2B marketers are running Facebook Ads, but few are running them to promote content, and fewer are running them to great success. Facebook Ads allow content and B2B marketers to promote their brand and services to an incredibly specific and valuable audience. They are extremely affordable and extremely testable. Wishpond has found success with Facebook Ads before and continues to use them to great effect for both clients and our own content campaigns. Lead are valuable to your business. They’re worth investing in and they’re worth spending money to attain (especially if you’re seeing a 200+% ROI).